It's not often that I regret spending money watching a movie, especially one about food. However, Miss Y and I didn't know what to think after watching Burnt starring Bradley Cooper. Sure, the food in the movie appeared delicious, but the whole thing was predictable and full of clichés. It made us appreciate the movie Chef even more than before. 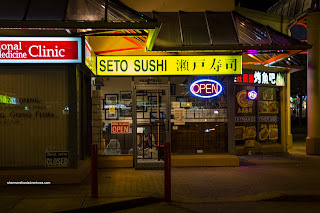 After that, our appetites were pretty full on, so we made it out to Seto Sushi along Restaurant row aka Alexandra Rd in Richmond. 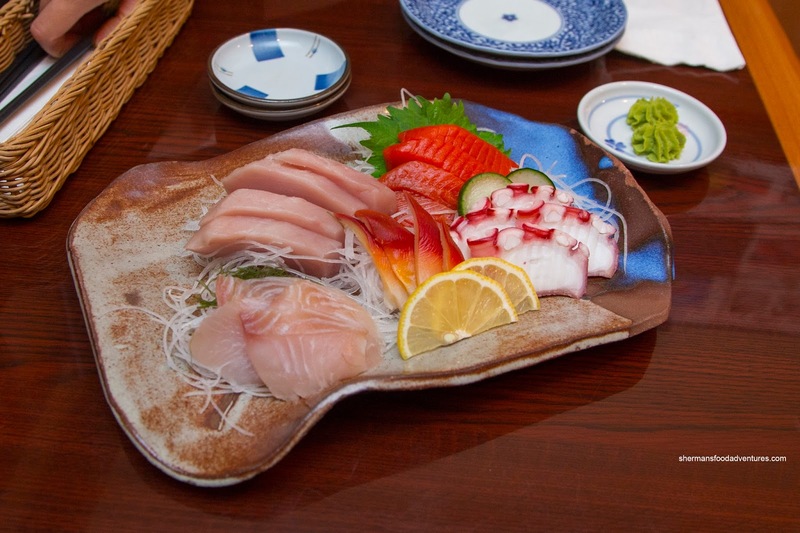 Strangely and almost troubling, the Assorted Sashimi arrived within minutes of us ordering. 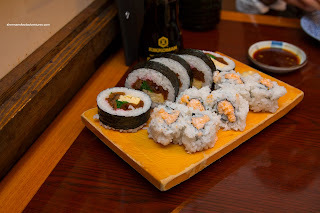 Well, we chalked it up to the skill of the sushi chefs, but then again, the slices of Tai were a bit clumsy looking. Despite that, the texture was not only on point, it was one of the best snapper sashimi slices I've had in awhile. It was buttery and appealingly firm. The Sockeye salmon was equally good while the tuna was sufficiently flavourful. For our 2 rolls, we got the 1/2 Futomaki and Chopped Scallop Roll. Neatly constructed, the futomaki featured firm, yet chewy rice with enough ingredients to balance off the rice. A bit messily made, the chopped scallop roll was a bit soft, but was naturally sweet. 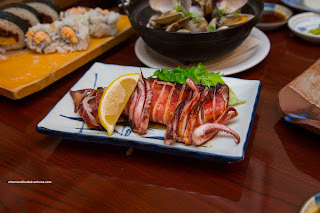 As simple as the Ika Yaki can be as a dish overall, it was solid. The whole squid was lightly grilled where the exterior was slightly chewy while the inside was still moist. It was simply seasoned with salt, which allowed the squid flavour to come through. We noticed that the squid itself was cleaned properly which meant the inside wasn't inundated with bits of innards. 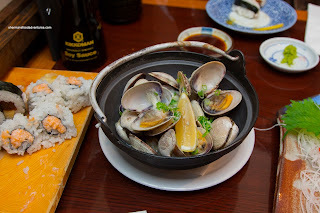 Continuing with another simple item, we had the Steamed Clams with sake. With a squeeze from the lemon wedge, there was a nice balance of natural sweetness, acidity and aroma from the sake. This went well with the barely cooked buttery and meaty Manila clams. Lastly, we had the Ankimo which was buttery and only kissed lightly by the sea. 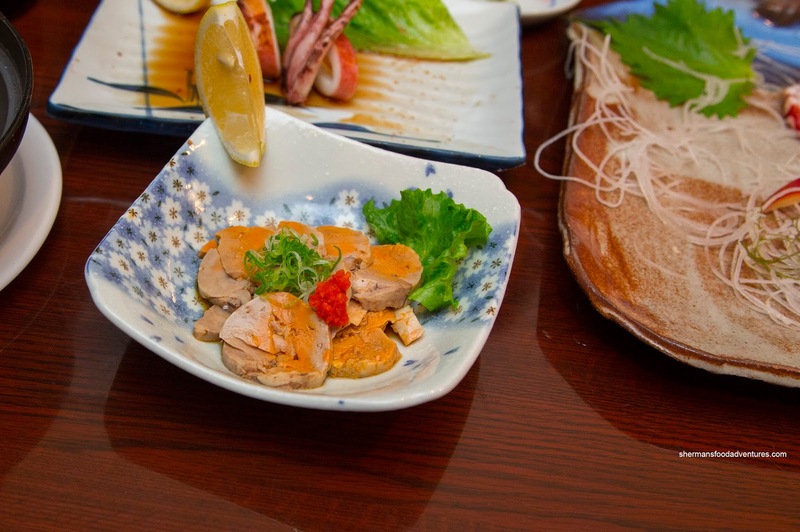 It was dressed with a tart ponzu which kept things balanced. Furthermore, it was properly prepped and prepared where the texture was consistent. In fact, the whole meal was consistently good where thing looked and tasted like we expected it to. Pretty much what one would want from a dining experience.